OMEGA’s PXM78 Series transmitter is a submersible transducer suitable for liquid level and depth measurement. Its all stainless steel, hermetically sealed housing make it suitable for immersion in most industrial liquids and oils. A 3 m (10 ft) vented cable (longer lengths available) provides an atmospheric pressure reference. 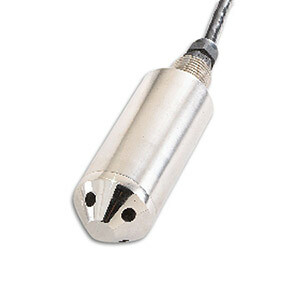 Each transducer is shipped with a moisture trap that prevents moisture from entering the vent tube. The PXM78 is also available in standard/Imperial configurations, with models from 0-4 to 0-15 psig pressure ranges. Please see the PX78 for complete details, or contact our Pressure department for more information..
Moisture trap included with all models. To order with extra cable add "-(length in meters)M". The Standard cable length is 3 m and optional lengths are available up to 91 m.